Money Advice +CRM hosts a comprehensive set of commission tracking tools allowing the busiest office to keep on top of commissions received, pipeline and keep admin to a minimum. 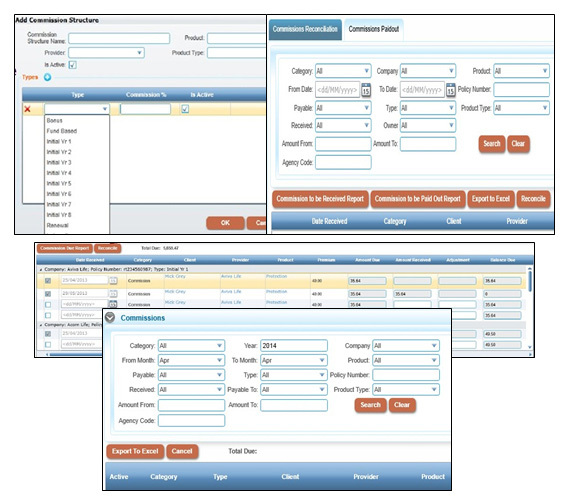 The system produces commission reports on a product, advisor and office wide basis. Full functionality is offered allowing product, product type, provider, type of commission, commission sum/percentage and commission structures to be added as required. The commissions/fees can be apportioned individually to individual staff, firm and 3rd parties as needed. Commissions are easily reconciled against individual policies and personal commission statements produced for Advisors, whilst a whole host of reports can easily be generated across a broad range of parameters by provider, product, agency code, staff member, introducer etc.